"Lose Weight and Get in Shape While Learning the Most Effective Self-Defense Striking System on the Planet!" If you have an interest in Muay Thai I urge you to take the time to keep reading and learn what we have to offer. You will learn about the many benefits you’ll get by giving our Muay Thai program a try and you can try it absolutely FREE for 7 days! 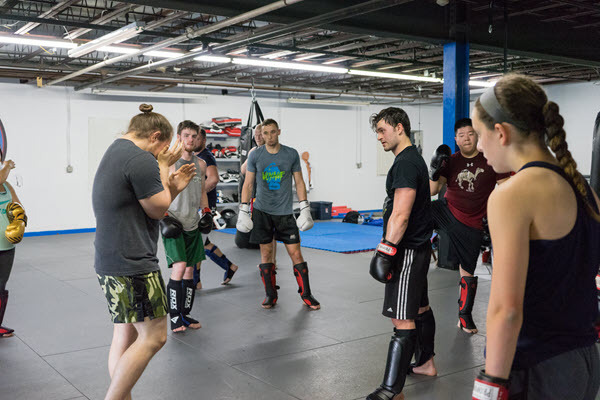 Hellfish Mixed Martial Arts has been helping all kinds of people in the Montgomery County area get into the best shape of their lives at our Muay Thai (also known as “Thai Boxing”) classes. As far as strike based martial arts systems go, Muay Thai is one of the most enjoyable workouts you can do. Muay Thai striking has been proven time and again to be one of the most effective striking arts. Just watch ANY mixed martial arts competition like the UFC or Bellator. The world’s best fighters train in at least some aspects of Muay Thai. They have to because its so effective. Muay Thai uses stand-up striking along with various clinching techniques to overcome and dominate an opponent. 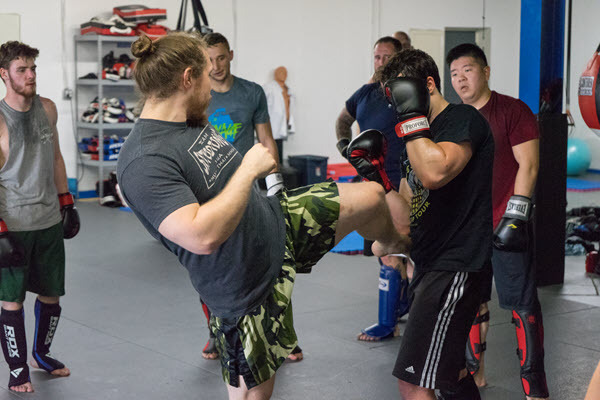 Practitioners develop incredible power in delivering devastating kicks, punches, elbow and knee strikes. The kind of knockout power that ends fights quickly! It doesn’t matter if you’re tall, short, big or small – everyone and ANYONE can experience the thrill of training real Muay Thai. No matter what level you start at, you will improve dramatically and see results even faster than you might expect. The majority of our students come for the great workout and to learn an effective striking martial art. You'll be part of the team from day one. You'll train in a safe, fun and supportive environment. Coming to class will be something you look forward to as part of your week. No previous martial arts experience is necessary. 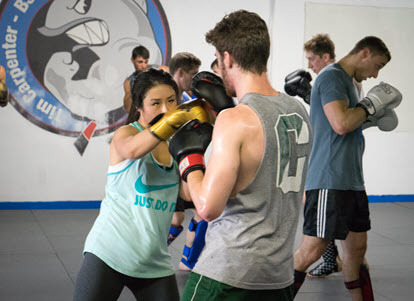 (everyone can enjoy the benefits of Muay Thai and we cater to the absolute beginner as well as the serious competitor. You'll be working your whole body from head to toe during our classes and building your endureance and cardio with each session. You’ll get to release your stress in a positive atmosphere that brings positive dividends to all other areas of your life. This list of benefits could go on and on. Finding a quality school that teaches real Muay Thai can be hard to find these days. There are just not many good schools out there that are qualified to train people in the art of Muay Thai aka Thai Boxing. The GOOD news is that you live close by to one of the top Muay Thai schools in your area. And we’re offering a One Week FREE Trial Program so you can see if our academy is right for you. Call our academy and schedule a time that’s good for you and one of our program counselors can go over with you how we can help you achieve your goals with our program. You can also fill out the form at the bottom of the page to get your 7 day free trial. We have no doubt you’ll be amazed with what we can do for you. Give us a call right now at and let us help you get started. P.S. You have absolutely no obligation to join when you come in for a visit. All we’re asking is for you to give us a fair try to let us prove to you exactly what we can do for you. Would You Like More Information On Our Muay Thai Program? Enter your contact info below to find out how you can get started with your 7 day FREE trial!